I used dinosaur cookie cutters on whole grain bread. I don't own sandwich cutters, but that'll need to change soon. The detail on these cookie cutters is a bit disappointing. The T. Rex looks like an ear-less rat. The amorphous blobs are supposed to be a Triceratops (lower left) and Pterodactyl (upper right). The Apatosaurus and Stegosaurus are passable, though. And once they're in action as sun-butter sandwiches in my son's stainless steel lunchbox, I'm feeling pretty happy about them. Have a fun Thanksgiving week! 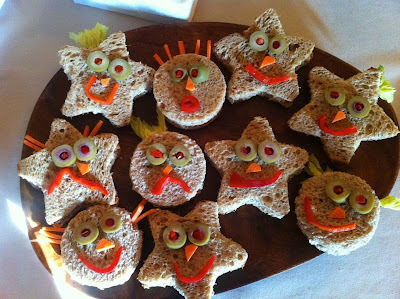 Let me know if you have a sandwich cutter you love, or any other fun lunch tips! I love that the sandwich play lives on! So many possibilities! Where did you get your lunchbox? I love it. We have stainless Lunchbots, but they don't have all the bento-y compartments that yours has. Ah yes, the Planetbox! http://www.planetbox.com/ It's so easy to clean and no lids to worry about, plus you can decorate the top with magnets. Two thumbs up.